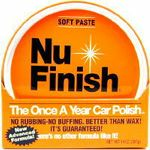 The Nu Finish name has been well known among car enthusiast for over 50 years to offer waxes and cleaners that are easy to apply, look great and last a long time without having to reapply multiple times to achieve the shine your looking for. Auto Barn carries a full line of Nu Finish interior and exterior cleaners, waxes, and protectants, such as, Nu Vinyl Protectant (provides a long lasting protection and shine to vinyl and rubber auto and household products), Nu Finish Car Wash (features an exclusive formula that safely washes away dirt, grease and salt), Nu Finish Car Polish (proven to bead, shine, and protect for a whole year), or Nu Finish Scratch Doctor (safely removes surface scratches and swirl marks from all painted surfaces, including clear coat finishes! ), to keep your vehicle looking its best both inside and out all year round.